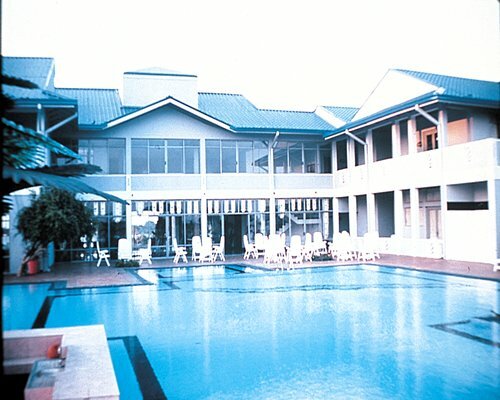 The nearest airport is Bandaranaike airport in Katunayake,near Colombo.It is about 265km away,to the south,near Hambantota town.If arriving late, it is advisable to spend the night in Colombo as travel time to the resort is about 5-6hrs by car.Alternatively, contact the resort for pick-up service at a charge. Contact them in advance to ensure that you have confirmation for pick-up &amp; tour arrangements prior to your departure. (T:94-47 2220650/51/52) email:theoasish@eureka.lk Kindly contact them in advance too if you are arriving late or on another day. Mandatory Utility surcharge is 60 local currency. Cash or Credit is accepted. for all type of unit Per week. Resort has only hotel units for occupancy of 2pax. Members confirming studio, 1bedroom &amp; 2bedroom will be allotted 2 or 3 separate hotel units accordingly (each room for 2pax). Utility fee charged according to no. of unit alloted. Although the resort has a beach, it's too rough for swimming resort will be able to advise location of swimmable beaches.